Figure 10.42 A full house at Maple Leaf Gardens, 1932. Note the 1930s-vintage jumbotron. Modern sport emerged in the second half of the 19th century under the conditions of industrial capitalism in urban contexts. Embraced by upper–middle-class professional men, who had both leisure time and a belief that the practice of physical competition would inculcate the values and skills of civic leadership, early organized sport was imbued with the ideologies and regulations of amateurism. The classed and gendered realities of amateur sport, which was almost exclusively male until the 1920s, informed global movements such as the Olympics and continued to hold sway until the 1970s. Despite the influence of middle-class notions of respectability in establishing the values of amateur sport, sporting events were also included within the popular commercial amusements of the late-19th and early-20th centuries. Often organized around one-off contests in individual sports — such as rowing, boxing, foot-racing, and horse-racing — commercial sport was associated with disreputable practices such as drinking, gambling, and rowdy behaviour among spectators. Moreover, the professional athletes who earned a living through such events were castigated by amateur sport leaders as having sacrificed the character-building aspects of amateurism and the pursuit of sport for sport’s sake. By the 1930s, the sanctification of professionalism as a marker of ability rather than a moral failing was well underway. One of the most significant features of this shift were the spaces that were built to accommodate paying customers (spectators), most prominently in the 1920s. In the decades prior, spectator behaviour was a significant issue for entrepreneurs. Profit was tied to the respectability that was conferred upon the practice of spectating. Indeed, one of the earliest appearances of women as sport spectators was the late-19th century creation of Ladies’ Days at baseball grounds. (Baseball was one of the few team sports that did not attract the interest of amateur sport leaders.) Women were admitted free to games in the hopes that their presence would improve the behaviour of the men in the stands and on the field. By the 1920s, the built-spaces for sport had evolved considerably. Consider the case of hockey in Toronto and New York. Ontario’s first artificial ice rink, Arena Gardens, opened in December, 1912 and had, according to the Toronto Daily Star, “room for 2,000 skaters and 7,000 spectators.” Typical of arenas built in this era, when facilities were intended as much for participation as spectating, Arena Gardens’ management set aside Friday nights for public skating. 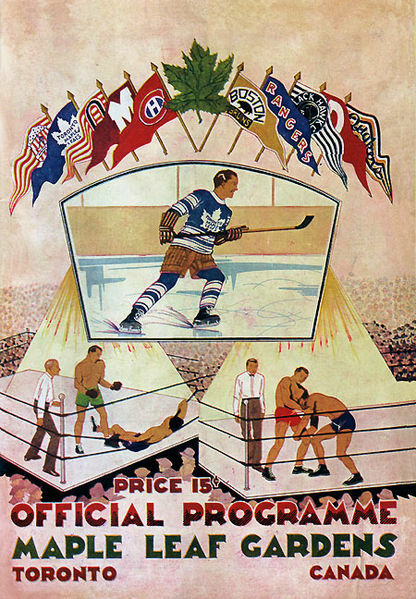 Cultural and economic circumstances were markedly different for commercial hockey in Toronto only two decades later, and public skating was not a feature of the arenas built in the 1920s to 1930s. The defining feature of these new sporting palaces was that, above all, they catered to spectators interested in spending disposable income on watching sporting events. The experience of the sport spectator did not occur within a vacuum, but among an increasing array of consumption possibilities in the 1920s and 1930s. The building of sport spaces needs to be understood alongside the construction of other major sites of public consumption in interwar cities, including vaudeville theatres and music halls, cinemas for the new “talking” motion pictures, department stores, and museums. To compete in the burgeoning entertainment economy of the late 1920s, entrepreneurs located their arenas in entertainment districts. The new Madison Square Garden, for example, was built in 1925 only a block from the Broadway theatre district, far removed from its eponymous square. Investors in these facilities envisioned sport spaces that would project an aura of middle-class respectability. Architects with experience designing non-sporting spaces of consumption such as theatres and department stores were called upon to create these new arenas. In both Toronto and New York, architects sought to gentrify the practice of sport spectating without eliminating the possibility of distinctions within the arena. The nature of the seating, for example, was increasingly less comfortable as one travelled higher in the arena, and the building was designed to prevent spectators from moving between the different tiers of seats. Figure 10.43 Respectable but rough. Entertainments at the newly erected Maple Leaf Gardens are very masculine but also overseen by fair-minded referees. Note that the NHL banners include 10 teams (not the so-called “Original Six” that survived the Depression and WWII). 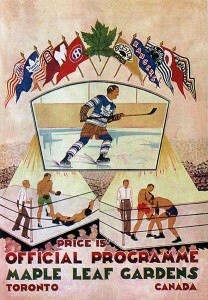 From the Leafs’ first match at Maple Leaf Gardens in 1931. Into such spaces entrepreneurs hoped to attract a respectable middle-class spectator, one who was likely male but who would feel that the new arena offered sufficient comfort to bring a female companion. An analysis of ticket subscription records from the mid-1930s reveals that Maple Leaf Gardens attracted a crowd of middle-class men and women. But the presence of a middle-class audience does not imply that its members always spectated in respectable ways. The spectator experience cannot be easily distilled to a single experience — indeed, it was a pastiche of many different experiences. Former box-seat patrons at Maple Leaf Gardens recall the expectation to be suitably (and formally) attired, while others who were located elsewhere in the arena remember the impact that such demonstrations of respectability had on their own choices. By contrast, former spectators at Madison Square Garden recall the highest tier of the arena being the denizen of the gallery gods. Designed with the narrow confines of the boxing ring in mind, rather than the wider field of vision required for hockey, Madison Square Garden’s gallery required most patrons to stand, leaning forward, enjoying the spectacle in physical contact with one another. Within this milieu, a culture of spectating unique within the arena developed — from the practice of racing upstairs to claim non-reserved seats to the insults and projectiles that were hurled. Many spectators took pleasure in the spectacle that unfolded on the ice surface before them, both in the speed of the game and its (often violent) physicality. But it was not the spectacle alone that attracted the spectator. Former spectators recall the many ways in which hockey spectating was a social occasion: a parent taking a child to his/her first game, a heterosexual couple going on a date, as well as couples choosing to attend with other couples. The dominant narrative is that many women entered arenas on the arms of the men escorting them to the game. Despite this, there were women who went to hockey games at Maple Leaf Gardens in the interwar years in the company of other women. One female spectator recalled how she and five companions, all female, went to professional hockey games in Toronto every Saturday from 1925 to 1931. This dedicated group began spectating prior to the opening of Maple Leaf Gardens in 1931, but, with the construction of the modern, new arena, their weekly outings took on the air of an occasion as the sextet dressed in their finest each Saturday night. This woman, whose grandson recounted this story, recalled the “fashion show in the stands” where she and her friends sat in Maple Leaf Gardens’ gray seats, the cheapest seats, most distant from the ice. While sport spectating has been constructed as a masculine pastime, in the new spaces of sport in the interwar years, women in Toronto also used one of the city’s most prominent public buildings as a site for their own socializing. The gentlemanly virtues of amateurism were at odds with the (largely working class) desire to be paid to play (that is, professionalism). It was also at odds with gambling and more individualistic sports like racing and fights. The creation of modern arenas and stadia enabled the merchants of sports to present their products in a more respectable environment that competed well against other entertainment options. A barometer of respectability was the extent to which women felt welcome to the new arenas and were eager to attend matches. Field, Russell. 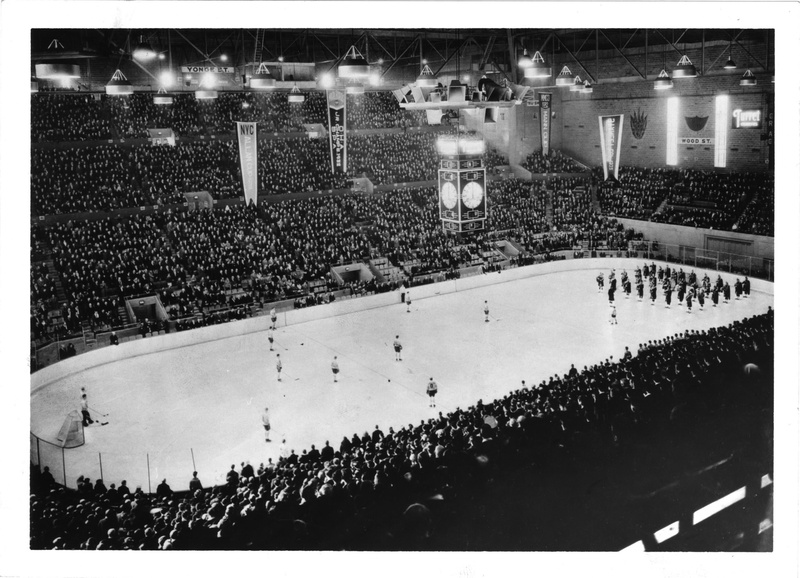 “Constructing the Preferred Spectator: Arena Design and Operation and the Consumption of Hockey in 1930s Toronto.” The International Journal of the History of Sport, 25 (6), May 2008, 649-677. Field, Russell. “‘There’s more people here tonight than at a first night of the Metropolitan’: Professional Hockey Spectatorship in the 1920s in New York and Toronto”. In Andrew Holman. (Ed.). Canada’s Game: Hockey and Identity. (Montreal and Kingston: McGill-Queen’s University Press, 2009). Howell, Colin. Blood, Sweat, and Cheers: Sport and the Making of Modern Canada (Toronto: University of Toronto Press, 2001). See especially Chapter 3: Money. Maple Leaf Gardens, Carlton St. north-west corner Church St.; Interior, Toronto, Ont. by Special Collections Toronto Public Library is used under a CC-BY-SA 2.0 license. MLG 1931w by Kordas is in the public domain. 10.17 Commercial Sport and Spectating by Russell Field, Faculty of Kinesiology and Recreation Management, University of Manitoba is licensed under a Creative Commons Attribution 4.0 International License, except where otherwise noted.